The Australian Trellis Door Company (ATDC) offers a wide range of rapid roll high speed doors suitable for most applications, including for use in cold storage environments. Cold storage environments are prevalent in food manufacturing, pharmaceuticals, certain logistics facilities etc. Cold storage facilities generally require heat to be kept out and cold air to be contained inside the room. Historically, heavy, insulated solid doors have been used to try and achieve this. These doors generally open to the side to allow access in and out of the storage room. These doors are generally heavy and are slow to move. Their slowness of operation inevitably allows cold air to escape making temperature control a challenge and requiring larger energy loads to maintain the cold storage environment. This comes at a financial cost to the operator of the cold storage facility. As a result, the use of rapid roll high speed doors are becoming increasingly popular in such environments. They are fast moving which assists in maintaining temperature control by preventing cold air escaping during operation of the door. Suitable rapid roll high speed doors have considerable insulation and sealing characteristics further aiding temperature control. Furthermore, high speed doors can offer many safety features such as motion sensors to avoid hitting obstacles in their path e.g. people or forklifts. 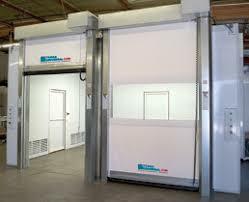 For further information on their rapid roll high speed doors contact ATDC toll free from anywhere in Australia on 1800657435 or click here to visit the relevant page on ATDC’s website.